The cognitive approach to the interpretation of the landscape requires holistic paradigms (sensu Naveh 2000) in which the landscape is considered an agency composed of a structural matrix or mosaic, a collection of interacting organisms and a set of natural and human governing rules (Fig. 9.1). Fig. 9.1 The three main ontological categories composing the landscape when considered as an eco-semiotic interface. Geography (structural matrix), biological characters (organism collection), and meaningful information (governing rules) create a complex agency in which human action can be carried out along an historical path. The environmental matrix represents the component of the earth's surface poised between the untouched mineral part of the soil and the atmosphere. The matrix is composed of soil, vegetation cover, and animal communities. Largely influenced by climatic and biological constraints the matrix is epistemolog-ically connected with the ecosystem paradigm. It is an entity represented by three dimensions: a surface (x:y) and a depth (z). Most landscape studies focus on this structural approach (e.g. Naveh and Lieberman 1984, Risser et al. 1984, Forman and Godron 1986, Turner 1989, Turner et al. 2001, Forman 2008, see also Turner 2005, Wu and Hobbs 2007 for a review) investigated often by applying remote sensing techniques and GIS facilities. If the structural matrix appears fixed or neutral, at least from a human paradigmatic perspective, every species or individual will perceive and create semethic connections (sensu Hoffmeyer 2008) only with some elements of the matrix that are relevant for their biological functions. Definitively, the structural matrix alone is unable to provide enough information about the mechanisms by which individuals or species extract resources from the landscape. Organisms in turn are components of this matrix, they use it, and contemporarily they are agents of modification through their behavior. The typology of the matrix influences the distribution of the organisms and modifications of the matrix by internal or external constraints have dramatic effects on abundance and richness among populations and communities. With the term "rules" we mean habits, conventions, uses, and laws that produce order inside the matrix, and affect organisms and their interactions. In the humandominated landscapes rules are composed of religious, ideological, economic, and cultural conventions. The interactions between rules, matrices, and organisms create an emergent material and un-material spatially explicit entity that we call the "human (societal) landscape" (Fig. 9.2). Fig. 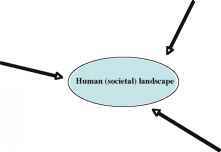 9.2 The relationship between the main actors of landscape ontology creates a complex dynamic human (societal) landscape. Fig. 9.3 Changes of the geometry of the elements that characterize a matrix at a specific time can affect the survival of several organisms. This effect can apply to traditional ecological surveys based on the evaluation of type and cover of habitat types or land uses. geo-botanical and climatic characters do not appear altered. In fact often it is taken into account that the population dynamic interacts with the "landscape" matrix and not merely with the "habitat" characters. Definitively shape, size, and spatial arrangement are key elements affecting presence, abundance, and persistence of species. When new (invading) species enter a matrix they can completely modify the matrix. 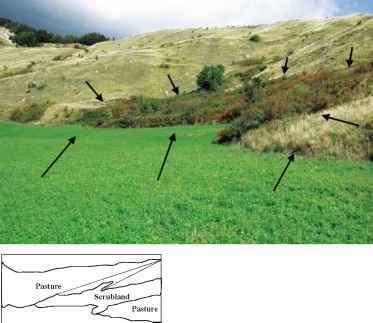 For instance, when sheep were substituted with feral horses along Mediterranean uplands, grass cover and diversity appeared to be strongly modified. Size and foraging strategies alter the vegetational dynamics and species composition. In the same way the invasion of wild boar (Sus scrofa) alters soil stability through the ploughing action on the vegetation cover. Finally, rules are the necessary elements to govern and address adaptive solutions and are expressed by natural and human-made constraints. The effects of the application of the rules have an important influence either on the structural matrix or on the modalities of perception and cognition, producing complex dynamics such as land abandonment, species extinction, migration, invasions, source-sink dynamics, habitat deterioration, etc. In this way when a central government decides to protect an area (acting on rules) the effects of such a choice modify the local economy and societal organization, animal and plant communities, and land cover as well, with intermediate effects due to the environmental complexity and energetic tradeoff. Societal conflicts can rise when new rules are introduced in a region and the different perspectives of the stakeholders open social debates and conflicts. Most of the rules created in the name of sustainable development are based on the goal of increasing human well-being (Sayer and Campbell 2004) but this story remains highly questionable and additional principles like ethics are requested to complete such a speculative scenario (Haber 2004).